Jodi practices physical therapy at the UW Yahara Clinic and specializes in neurologic, geriatric and vestibular physical therapy. She performs specialty wheelchair seating evaluations. 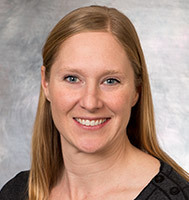 She is a provider in the multi-disciplinary UW Health Mobility and Falls Clinic. Her special interests include balance, falls and dizziness. Jodi is a member of the American Physical Therapy Association, the Wisconsin Physical Therapy Association and the Vestibular Disorders Association. Jodi holds a Master of Physical Therapy degree and a Doctor of Physical Therapy degree from Northwestern University in Evanston, IL. She is a Herdman-certified provider of vestibular rehabilitation and treats patients upon referral. Jodi has worked on the Dane County Safety Assessment for Elders (SAFE) research study and on the dissemination of the Stepping On® program.